As ever with bike show season, the Internet is full of pictures of the latest and greatest things to come from aircraft hanger scaled halls of Southern Germany and Las Vegas but often behind the immediacy and attention grabbing is often a bigger story. For the tech team at CW, that story is the idea of proper (read dedicated, road specific, hydraulic) disc brakes. 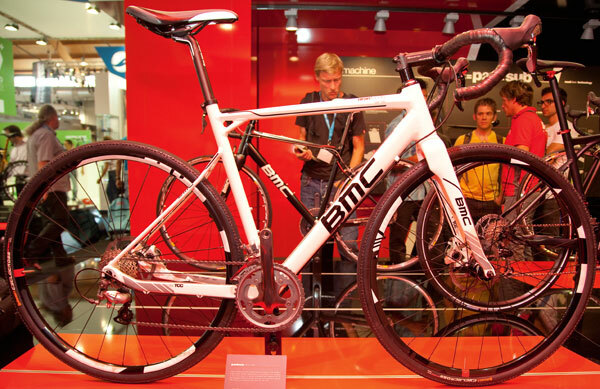 Perfected on the mountain bike scene over the last decade it’s not surprising in many ways, that the world’s road bike designers felt there was a case to be made for improving road bike retardation. In theory, discs offer not necessarily improved power, but far more control over your braking. They are also almost impervious to climatic changes. Who hasn’t been out in the rain and had the split second of ‘Oh My God’ as the pads sluice the rim surface of water for a wheel revolution or two before beginning to bite. On many carbon wheels the moment is both longer in it’s initial phase and less effective in the secondary one. With this potential for weatherproof braking and more control over the actual process, what’s not to like? To get the absolute power to useable levels for a small road bike tyre contact patch rotors need to be downsized, to cool a rotor efficiently, surface area is everything. Getting this balance right and having a system that can cope with the heat levels is going to be key to the success of road bike disc brakes. When you brake, your speed (kinetic energy) is turned into heat (heat energy). With a standard wheel, the large surface area absorbs and then dissipates this heat as the air flows over such a large surface area. 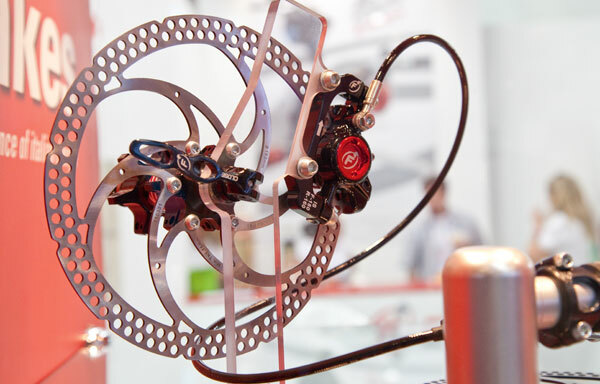 On a disc brake, this surface area is small, but generally the rotor is more effective at cooling down due to the profile, slots and materials combined. The problem with disc brakes comes if this heat isn’t removed. If a rotor gets too hot (for example, if dragged on a long alpine decent) the energy is transferred through the brake pads and onto the fluid in the system. If too much heat gets into the fluid it can boil and release compressible gases. This is bad because if you’ve boiled your fluid and pull the lever – nothing will happen. As with anything that sounds perfect, there are actually some drawbacks. 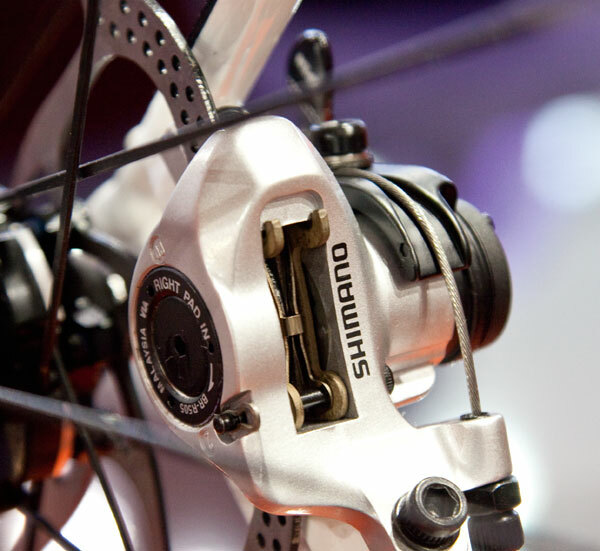 Frames not only need to be redesigned to incorporate the actual disc mounts, the internal structure – be it carbon, steel, titanium, carbon or anything else – needs to be modified to cope with the loads the brakes will transfer to area’s not typically designed to cope with them. Fork legs have been tuned over the last few years to offer lateral stiffness with some semblance of comfort too so it may well take engineers a while to get the ride quality back up to these levels as they will need to work in extra strength to not only cope with braking loads, but also twisting forces at the hub. Not only is there potential bulk here, but any thicker walls will are likely to be detrimental to the ride quality too. On the plus side, removing braking loads from the seat stays, does potentially add a chance to add some flexibility to the rear of the bike, adding comfort. Wheels are the other obviously affected component. Much like frames and forks, it’s a case of swings and roundabouts. Without the need for a braking surface, rims have the potential to be lighter as the sidewalls do not need to resist the compression loads and heat build up. 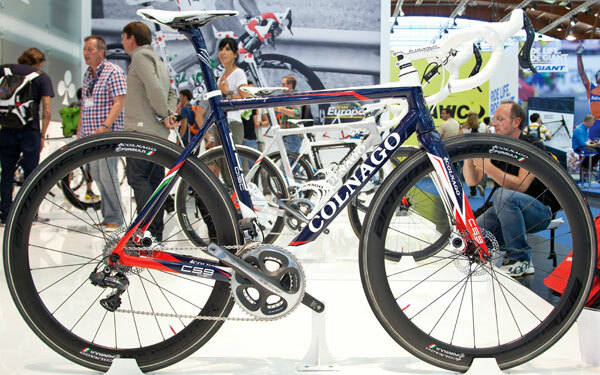 There are also potential gains to be made for carbon clinchers. It is often the resins and particles used to combat heat build up in a carbon clincher brake track that adds substantially to the cost. Conversely, to resist the additional strain that will go through the hub itself, and to actually attach a rotor, there is an inevitable weight penalty over a standard hub. Spokes need to be more robust to better resist the braking loads, and similarly, the spoke bed at the rim needs to cope with these same loads. 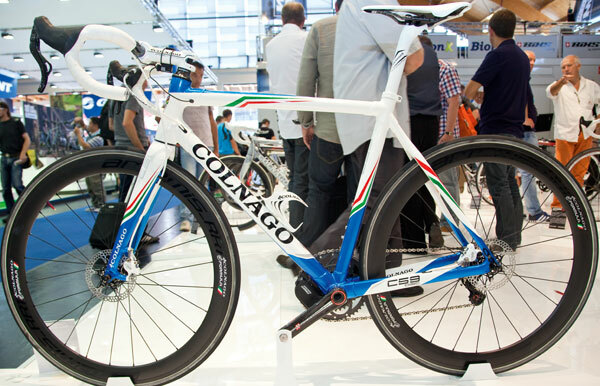 Colanago was one of the big hitters at Eurobike with disc brakes. In fact they were the only brand with hydraulic stoppers thanks to their collaboration with Italian company Formula in developing the products over the course of the last 6 months. A new carbon lay-up hides within the familiar shape of Colango’s all new C59 Disc. Thinner walled seat stays, and toughened fork ends on the all carbon – still straight legged – fork. 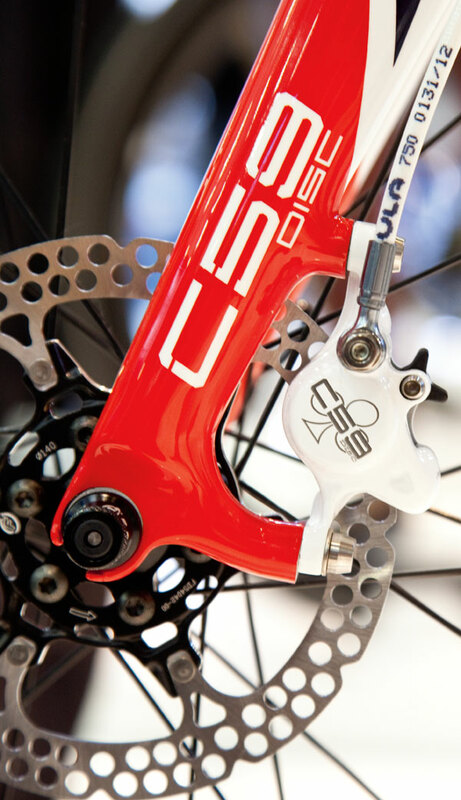 With a hydraulic master cylinder located in the Formula drop-bar lever and Campagnolo EPS connectors, the rear mechs can be actuated via familiarly placed paddles and levers. 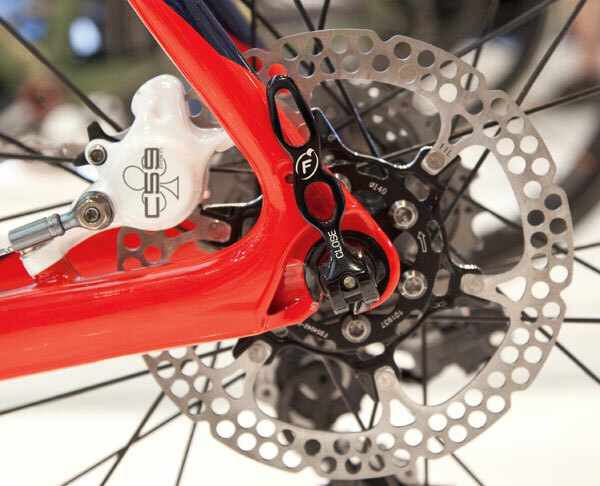 The absence of SRAM’s Red 2012 Hydraulic discs – soft launched back in February – from the Eurobike show was a definite surprise. 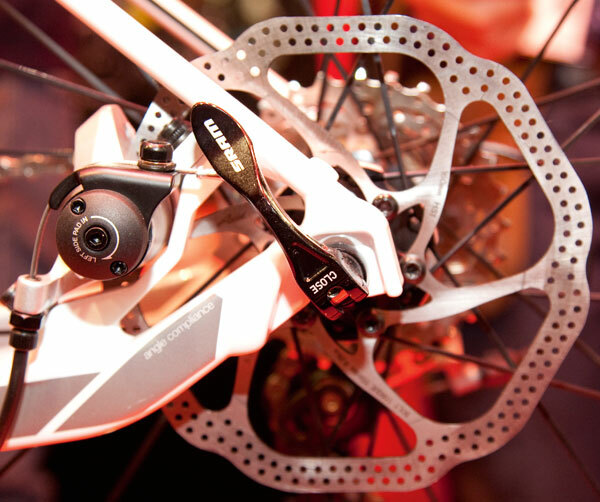 There existence proves that SRAM like the idea but they had this to say; “SRAM believes in disc brakes for Road and Cyclocross use. They provide consistent performance in all riding conditions. Further proof, if any were needed, that the bike industry thinks road discs have legs is the amount of wheel manufacturers launching disc brake product. 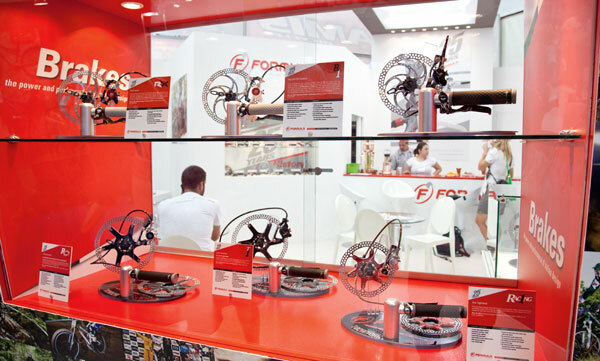 Around a third of the wheel brands had something on show at Eurobike. Heres a few standout options from some of the bigger players. disc ready, tubeless alloy rimmed wheelset with 23mm wide external diameter for reducing tyre rolling resistant. Using the carbon clincher rim from standard Assault wheels and a hub from their XC mtb wheels, these should be pretty bombproof and good value. This article was first published in the September 20 issue of Cycling Weekly. You can also read our magazines on Zinio and download from the Apple store.